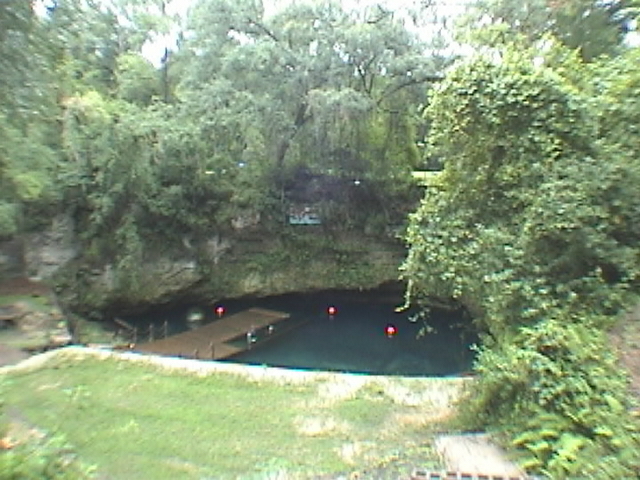 Blue Grotto is actually a sinkhole with good visibility. Depths reach 100 ft. Upon entering the sink you will encounter a very large cavern with writing on the walls. At a depth of 30 feet there is a fresh air bell so you can take off your mask and breath some fresh air. Continuing down, there is a large shaft that slopes down at a 90 degree angle. At around 90 feet you will encounter silt that can be easily stirred up. There are lights at 30 ft to illuminate the cavern. The owner, is very friendly and also manufactures dive, wreck and video lights. Blue Grotto is located just west of Williston on Alternate US 27. Take I-75 (exit 74) if you're going south or exit 70 if traveling north. Go west on Hwy 121 or Hwy 27. Once you get to downtown Williston head west on Alternate Hwy 27. Blue Grotto will be about four to five miles past the shopping center and water tower on the left side of the road. Just look for the Blue Grotto sign on the highway and take the left onto the dirt road.